You can track all items related to a particular project or task by using color categories to easily identify and organize the items. Besides calendar items, you can assign color categories to contacts, messages, tasks, notes, and journal items. Color categories connect your calendar items for easy identification. The color categories connect you to other related items too, such as messages or contacts. Categories only apply to items in your calendar. 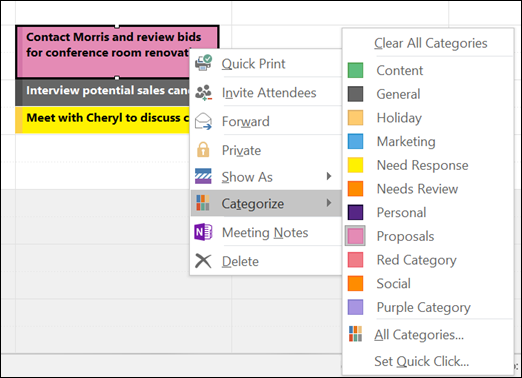 If you apply a color category to a meeting request or a meeting you've received from another person, that color category will only show in your calendar. The same categories list is used for all Outlook items, including email messages, tasks, and contacts. If you don't see the category you need in the list, choose All Categories. From there, you can view additional categories not shown on the right-click menu or create and assign new color categories. For more information on creating and assigning your own color categories, see Create and assign color categories. From your main calendar view, right click the appointment, meeting, or event, point to Categorize , and then click a color category. From an open appointment, meeting, or event, look for the Categorize button on the ribbon, in the Tags group. 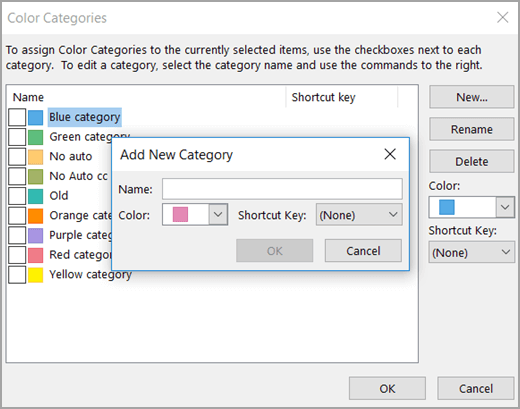 To see more categories or to create a new category, click All Categories to open the Color Categories dialog box. 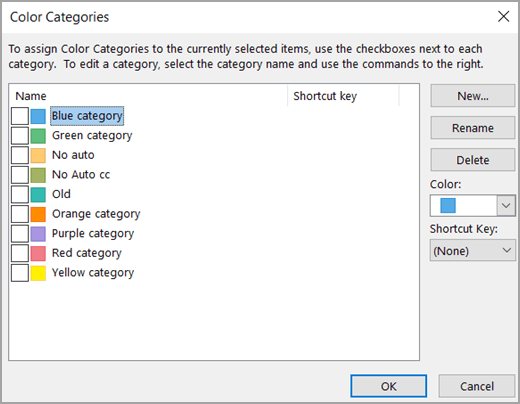 To assign a color category from the Color Categories dialog box, select the check box next to the color category. The Color Categories dialog box is also a quick way to assign multiple categories to an item. The first time that you assign a default color category to an item, you will be prompted to rename the category. At this time, you can also change the color of the category and choose a keyboard shortcut. You can change the color associated with a category at any time. Another way to open the Categorize menu and Color Categories dialog box is by clicking Categorize on the toolbar. Only the 15 most recently used color categories appear on the Categorize menu. To see the rest, click All Categories on the Categorize menu.